A rural house in Ontario doesn't fuss around and fits right in the surrounding landscape. The 925-square-foot house Maggie Treanor calls home blends into the landscape somewhat; with a galvanized steel shed roof and siding, it looks like a high-design little brother to the barns on the surrounding farms. Doors and triple-glazed casement windows from Loewen work hard to form a tight thermal envelope. Maggie Treanor waters plants around her rural home. The long gangplank of a deck runs right out into the fields, a fact that Treanor relishes. A covered porch on the south side provides comfortably shaded outdoor space, and its roof keeps the high-angle summer sun out of the house. Though small, Treanor’s house feels spacious thanks to an open kitchen and a tranquil mezzanine. As for the interior detailing, “In contemporary construction you have a layered approach to materials. Everything is on top of something else. We tried to avoid that.” Indeed, the house’s materials are few and hardy: polished concrete, maple, and Douglas fir, and white walls with a few bold accents of green and blue. A 1.4-kW solar array by Sharp and propane-powered in-floor radiant heating from Radiantec obviate any need to connect to municipal power. “In contemporary construction you have a layered approach to materials," says Lisa Moffitt. Everything is on top of something else. We tried to avoid that.” Indeed, the house’s materials are few and hardy: polished concrete, maple, and Douglas fir, and white walls with a few bold accents of green and blue. Though the house is only 925 square feet, Moffitt argues that it feels much larger, for which she credits three factors: its visual connections to the outdoors, its open spaces, and its simple interior-design language. A metal lighting fixture with an adjustable cord hangs from the ceiling. “Often when we talk about sustainability we focus on the gadgetry, what makes things feasible off grid,” Moffitt says. “But to me there are more interesting things in passive design that rely on the available sun and wind.” An eight-panel solar array does chip in significantly, generating all the electricity the house needs. The 925-square-foot house Maggie Treanor calls home blends into the landscape somewhat; with a galvanized steel shed roof and siding, it looks like a high-design little brother to the barns on the surrounding farms. Image courtesy of © Derek Shapton. After years of city living, Maggie Treanor was ready to move to the country, though she didn’t know how far her journey would take her. She first migrated in 2002, from the Ontario city of Guelph to a small town nearby, which “was like going on vacation,” she says. “Amazing sunrises and sunsets. I knew then that I wanted to move into the landscape.” A decade later, not far from Auburn, Ontario, in a rural corner of Huron County, she’s done it. Her living room looks directly onto cornfields, without a road or a power line in sight. 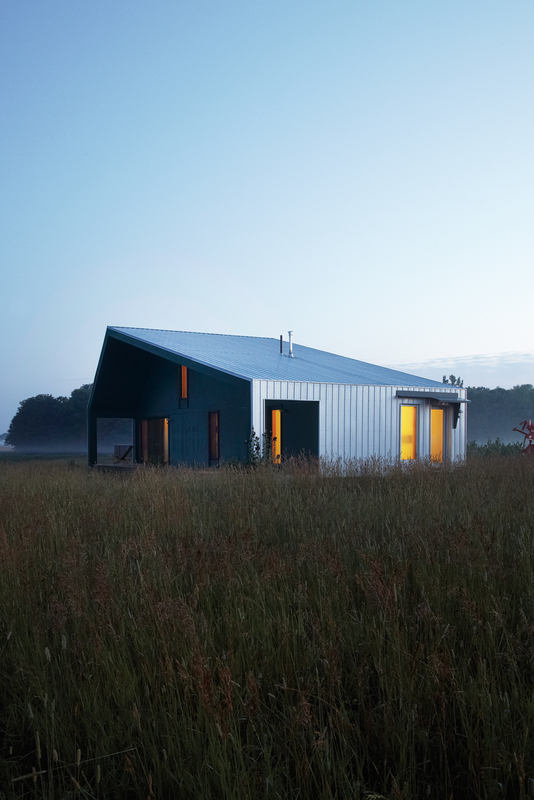 The 925-square-foot house she calls home blends into the landscape somewhat; with a galvanized steel shed roof and siding, it looks like a high-design little brother to the barns on the surrounding farms. And its energy footprint is equally subtle: Designer Lisa Moffitt (whose partner is Treanor’s son) built it with an array of sustainable features that take the simple home off-grid. As you enter the house on its east side, you can see straight through to Treanor’s land beyond; a 50-foot-long wooden walkway extends from the west side into the field, carrying you toward the horizon of waving grain. A covered porch on the south side provides comfortably shaded outdoor space, and its roof keeps the high-angle summer sun out of the house. Likewise, triple-glazed windows provide even sunshine throughout the day, which, combined with the house’s largely open interior, saves energy on both lighting and climate control. In the winter, a radiant heating system, supplemented by the lower-angle sun, provides consistent warmth. These elements, along with high-R-value insulation, help the house stay comfortable through the year, a tough task in a region where the temperature veers from zero to over 90 degrees Fahrenheit. “Often when we talk about sustainability we focus on the gadgetry, what makes things feasible off grid,” Moffitt says. “But to me there are more interesting things in passive design that rely on the available sun and wind.” An eight-panel solar array does chip in significantly, generating all the electricity the house needs. Moffitt’s ideas resonated with Treanor, who is nearing retirement from her job at an engineering firm and who has a long-standing interest in environmental issues. “I wanted just enough for me—something simple and gracious, not ostentatious,” she says. “From the beginning, the premise was a house that minimized impact on the environment. We wanted the farming activity to carry on as before all around the house.” And it does; Treanor leased her land to a nearby farmer, who grows different crops there each year. This year it’s the corn that grows right up to the house and the wooden walkway. Though the house is only 925 square feet, Moffitt argues that it feels much larger, for which she credits three factors: its visual connections to the outdoors, its open spaces, and its simple interior-design language. “There’s not a single place where you’re not aware of the larger landscape,” Moffitt says. “The double-height living room is such a generous space that it feels big.” As for the interior detailing, “In contemporary construction you have a layered approach to materials. Everything is on top of something else. We tried to avoid that.” Indeed, the house’s materials are few and hardy: polished concrete, maple, and Douglas fir, and white walls with a few bold accents of green and blue.